NELSAP strongly urges you to respect the property of the current owners and don't trespass. 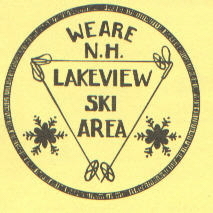 Lakeview Ski Area was located in Weare NH, in the vicinity of Horace Lake (hence, "lake view"). It was run by the Coburn family (local landowners, turned developers) and featured, as I recall, two trails served by separate tows - one trail was a modest slope, wide and accommodating, while the other (which I never had the nerve to try) was narrower, steeper and required a certain amount of stopping skills that I never developed. It had a warming hut where you could get a cup of hot chocolate. 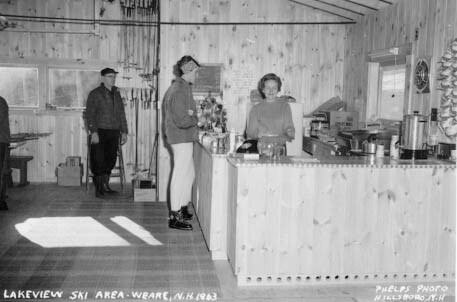 I recall my parents taking carloads of us & friends up there on winter weekends, in the days just as buckle boots were coming into fashion, and I'd tighten the rawhide laces of my hand-me-down leather boots and strap them (actually bear trap 'em) onto old Northland wooden skis. Bamboo poles?, you bet! My strongest memories include barreling flat out down the easy slope to the strains of "Penny Lane" blaring from their PA system, wearing through not one but both layers of my suede mitts while generating enough "traction" on the rope tow to get back to the top but, sadly, never learning how to stop well enough to avoid colliding with someone at the bottom of the run or, more likely, creating a spectacular "yard sale". Family run, I believe the children grew up or economics became a factor. In any event, the Coburn's moved onto other ventures (time shares & real estate) in the area and the ski runs shut down in the late 60's or so. Mike Coburn (a son) still lives in the area, married to one of my wife's school buddies from New Boston. Here is a Terraserver Image of the area thanks to USGS. 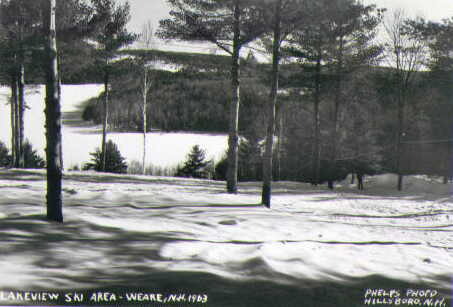 The ski area started at the building in the top left corner and continued down toward the lake. You can still make out part of the slopes and trails. 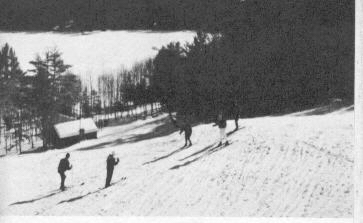 According to a brochure obtained during a March 2003 visit to Lakeshore Village Resort, which is now on the site of the former ski area, it was an "upside down" area with parking and lodge at the top of the slopes. 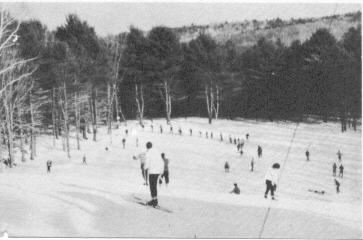 It was a family area with skiing, skating, tobogganing , and snowshoeing. They had two electric rope tows, tow slopes and two trails. The two main slopes were lighted for night skiing. Rentals were available. Lakeview was 75 miles from Boston, MA, 23 miles from Manchester, NH and 16 miles from Concord, NH, just off of route 114. The area was open weekends, Holidays and School Vacations and would operate at other times with reservations. 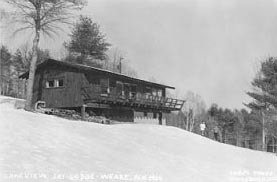 Windows on one end of the lodge allowed a clear view of the junior slope and windows at the front gave a view of the advanced slope and lake below. There was also a sun balcony attached to the lodge. (This structure is still standing and is now a private home.) 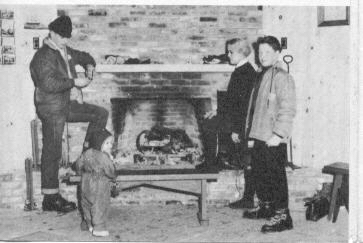 There was a corner fireplace on one end of the lodge and a rental area at the other end. 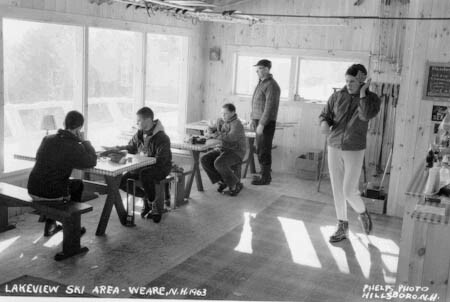 The lodge also had a snack bar with a complete kitchen and served lunches. The Junior Slope had a 450 ft. rope. The lower half of this slope was used for beginners. To the left of this was a toboggan run and toboggans were available for rental. 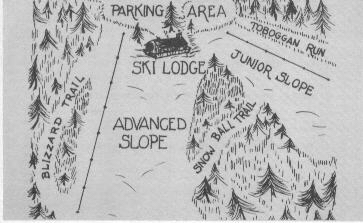 There was a trail called "Snow Ball Trail" which connected the Junior slope to the Advanced slope. To the right of this slope was the "Blizzard Trail". The Advanced slope and the Blizzard trail had a decent pitch to them, but were fairly short. The area had a 150-200 ft vertical drop. During Lakeview's last year of operation rates were $3.00 for a full day adult ticket and $1.50 for a full day junior ticket. Season Passes were $25.00 for an adult, $15.00 for a junior and $40.00 for a family. Additional pictures from the brochure. The "Lodge" as it looked in 2003. It's now a private home. The View from the top behind a new house that is at the top of the Advanced slope. This is a private home. The owner was outside when I was taking pictures from the road. He came over to talk to me and I told him I was researching the old ski area. He invited me on to his property to get better pictures. Please do not go on his property unless you have permission. The back of the former lodge and the parking lot. 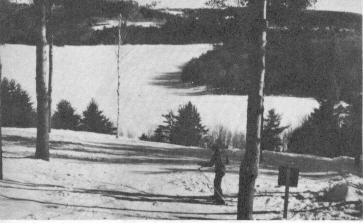 The Junior slope would have been to the left of the lodge in this picture and the Advanced slope was in front of the house and slightly toward the right of this view. Looking down the advanced slope. The area had recently been cleared again. One of the telephone poles from the tow. Looking down a slope. Very close to the same point the picture in the postcard was taken from. If anybody else has further info, just let us know.